Come learn 2 easy to learn and highly effective techniques! EFT (aka Emotional Freedom Techniques, Tapping, Meridian Tapping) has been around for a long time for a reason. It’s a highly effective and easy to learn healing technique that can be used by anyone. Tapping involves applying rhythmic pressure on meridians within the body to alter the body’s energy field and restore “balance.” It is especially effective at relieving negative emotional states (e.g., worry) and addictions. Muscle Testing (aka Applied Kinesiology) is used today by a growing number of alternative medicine practitioners (e.g., acupuncturists, chiropractors, naturopathic doctors). It involves applying pressure to certain large muscle groups, and the resultant strength or weakness of that muscle is believed to indicate the truth or falsehood of certain statements (e.g., “Is this supplement going to be beneficial to me?”). 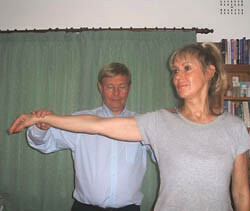 Once mastered, muscle testing can be used for both health reasons and psychic readings. NOTES: To learn more about Anne’s classes, see FAQ’s About Classes & Workshops and Anne’s Calendar.